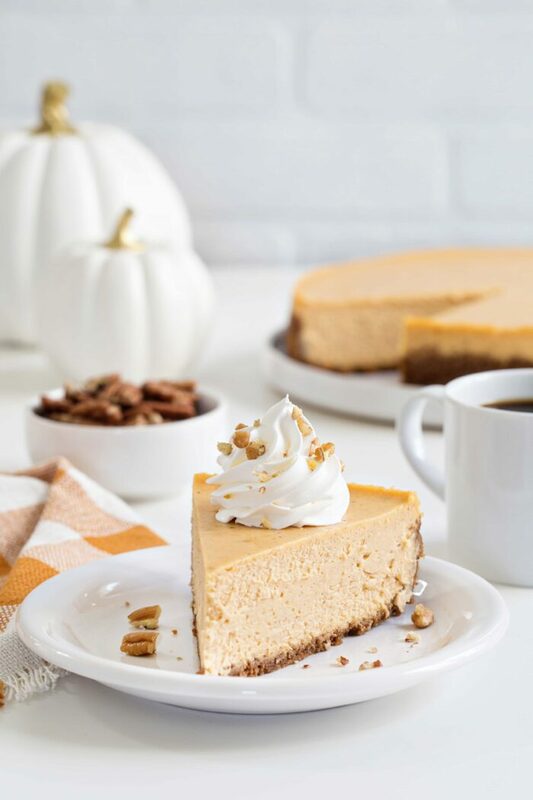 Sweet Potato Cheesecake is smooth, creamy and loaded with fall flavors. The buttery gingersnap crust makes it irresistible. I haven’t always been a sweet potato lover. I remember my Nana making canned sweet potatoes every Thanksgiving and I’d just pick the toasted marshmallows off the top when she wasn’t looking. In fact, I wasn’t fond of them at all until I was in my late 20’s and my stepmom introduced me to the real deal. A perfectly baked sweet potato drenched in cinnamon butter. I can’t remember if she made it, or we ordered it at a restaurant, but I’ve been hooked ever since. Ten years later, I’m the only person in my house that loves all things sweet potato. I had high hopes for Elle because she loved them in pureed form when she was a babe, but her three-year-old self isn’t having anything to do with them in any form. Who knows, maybe she’ll figure out what’s up when she’s 28. If you’ve been reading My Baking Addiction for any length of time, you know that I am seriously obsessed with cheesecake. From Salted Caramel Cheesecake and No Bake Cranberry Cheesecake to Cheesecake Brownies, and apple pie cheesecake this girl hasn’t encountered a cheesecake I didn’t like. Since cheesecake is pretty much my go-to dessert for any holiday, I simply couldn’t resist putting a fun spin on a classic holiday dessert. 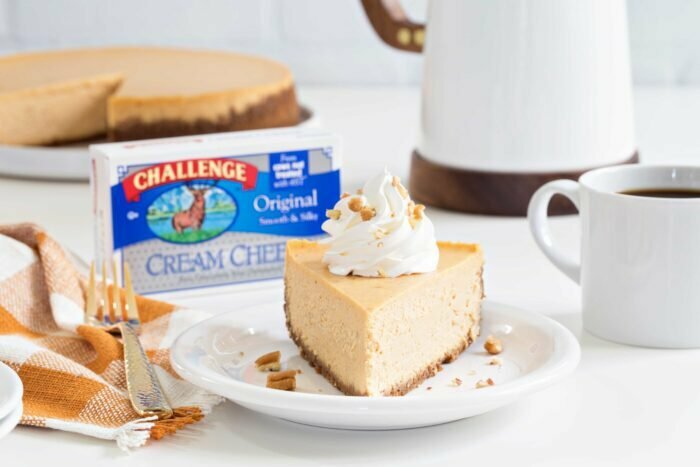 I find that so many of my readers are intimidated by cheesecake because they think they’re overly fussy, or that they’ll just end up cracking. To be honest, making a cheesecake is pretty easy and once you make one or two, you’ll be a pro. And not to toot my own horn or anything, but my cheesecakes always come out pretty flawless thanks to a fool-proof baking method that I’ll outline below. 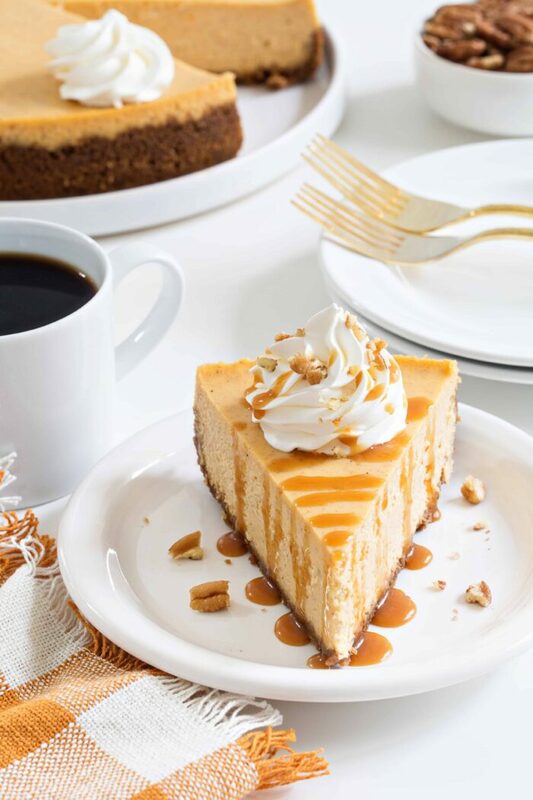 This Sweet Potato Cheesecake starts with a crisp and buttery gingersnap crust. It has just the right amount of sweetness and spice to compliment the velvety smooth sweet potato filling. 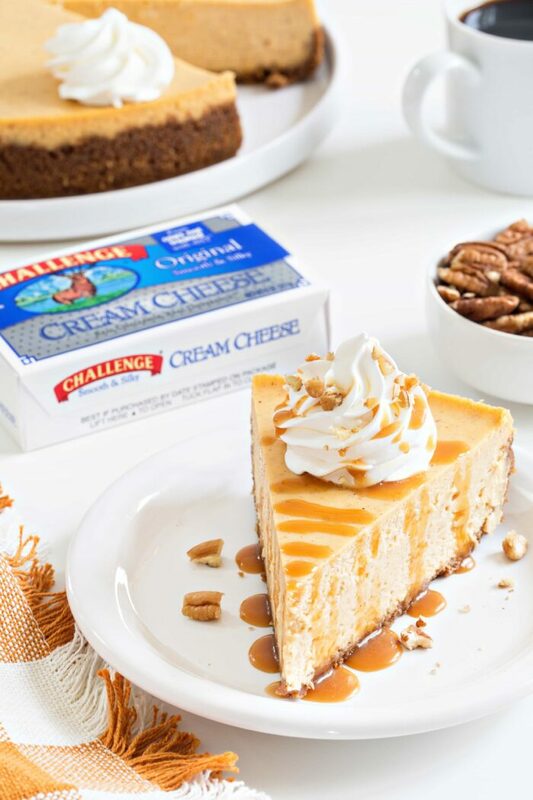 I made this Sweet Potato Cheesecake using Challenge Dairy butter and cream cheese. I love working with their products! Challenge Butter is made the old fashioned way, from the freshest milk and cream from happy cows at local dairies. They’re the only dairy product company that controls the whole process from milking the cows, to transporting milk, to making the butter, to packaging. And that’s something I can always get behind, which is why I continue to work with them year after year. After your cheesecake bakes up all gorgeous, you can top it off with whipped cream, pecans and a drizzle of salted caramel sauce. I mean, who could possibly resist a slice, or two? 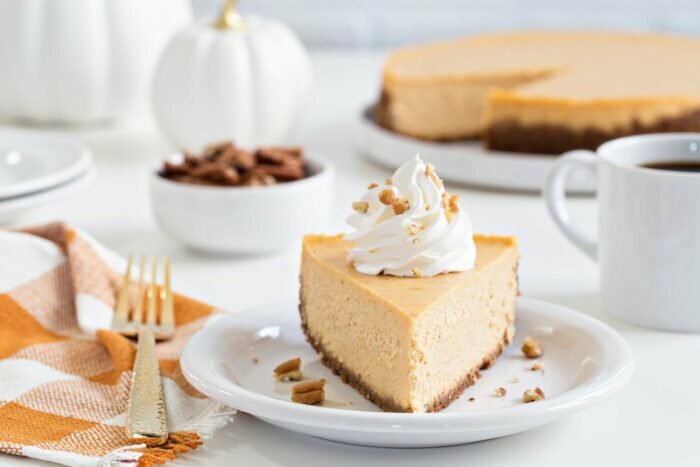 This Sweet Potato Cheesecake is sweet, comforting and it’s easily one of the best cheesecakes I’ve ever made. I hope you love it as much as we did! This Sweet Potato Cake is another great dessert to try! Tightly wrap a 9 inch springform pan in heavy duty foil. This step prevents leaks when using a water bath. I also take the extra step by placing the foil wrapped spring form pan inside an oven bag while baking, but this is optional. Lightly spray pan with nonstick cooking spray. Set aside. In a medium bowl, stir together crushed gingersnap cookies and melted butter until thoroughly combined. Press the crumbs into the bottom and about 1 inch up the sides of the prepared springform pan. Bake gingersnap crust in preheated oven for 8 minutes. Remove pan from oven and cool completely. Increase oven temperature to 400°F. Place sweet potatoes on a baking sheet and pierce each sweet potato several times with the tines of a fork. Bake until tender, about 50 minutes. Cool sweet potatoes completely. Once sweet potatoes are cool, peel and puree them. I used a food processor, but you can also use a blender. In the bowl of a stand mixer fitted with your paddle attachment, beat the cream cheese until smooth. Add sugar and mix until combined. Add eggs, one at a time, fully incorporating each before adding the next. Make sure to scrape down the bowl in between each egg. Add in pumpkin pie spice, vanilla, heavy cream and sweet potato puree and mix until smooth. Pour batter into prepared crust. Place pan into a larger pan and pour boiling water into the larger pan until it is halfway up the side of the cheesecake pan. After one hour has passed, carefully remove the cheesecake from the water bath and place on a cooling rack to cool completely. Once the cheesecake is completely cooled, place it into the refrigerator for at least 8 hours. Before serving, top with whipped cream, chopped pecans and salted caramel sauce. 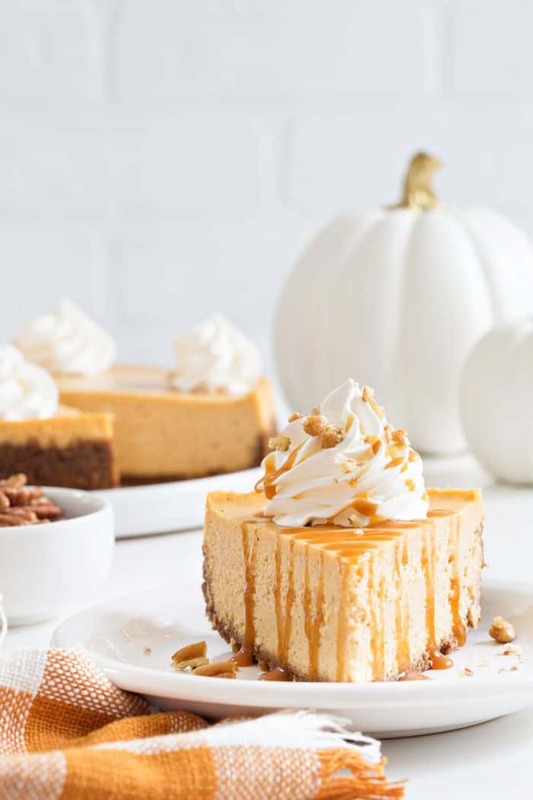 This is fall dessert perfection! I didn’t grow up liking those canned sweet potatoes with marshmallows either but a perfectly baked sweet potato is my absolute favorite these days. I couldn’t agree more, Milisa! Thanks so much for stopping by. Happy Holidays to you and yours! The cake looks so good! 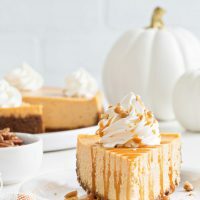 Never thought of combining sweet potato in a cheesecake! I am an adult lover of sweet potatoes as well. I don’t recall ever having the opportunity to try them as a child, and then friends said they were yucky. But when I actually gave them a chance, I found I really like them! This recipe looks delicious, and no one would guess it was sweet potatoes over pumpkin. It looks nice and light, and who doesn’t like cheesecake anything?! Thanks for sharing and Happy Thanksgiving to you and yours. Thanks so much, Roseanne! Happy Holidays to you and yours! Tell me more about the oven bag for the springform pan. My double layer of foil leaked again and the crust of my pumpkin cheesecake is soggy. How do you secure the bag? I really don’t secure it. I just put the pan in the bag and make sure the bag isn’t touching the batter. You can kind of roll the bag down if it’s in the way. I hope this helps! Cake is so yummy and want to try it for my children. Thank you for the recipe. Thanks so much! Happy holidays to you and yours!